I am exploring the impact of gangs and neighborhood violence on students within the Chicago Public Schools District. I want to investigate both student involvement in gangs and student experience with violence within schools and in their neighborhood, and the corresponding effects on educational attainment. After the recent school shooting event in Parkland, Florida, I was moved to bring light to the constant violence and deaths that go unnoticed by popular media. 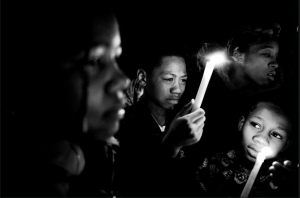 It is important to acknowledge the crime and violence that are present in urban environments on a daily basis, and the corresponding educational and psychological consequences of those who are affected. Gangs and violence remain prevalent throughout the city of Chicago, a city that has seen homicides range between around 350 and 970 since 1960 (Gorner, 2017). 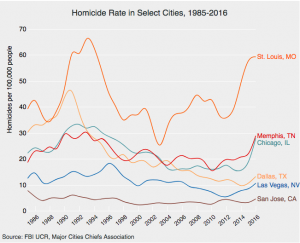 However, Gorner (2017), reporting for the Chicago Tribune, describes that violence in the city has dramatically increased in the last year, with 2016 and 2017 reaching homicide numbers that had been previously unseen in the past few decades. 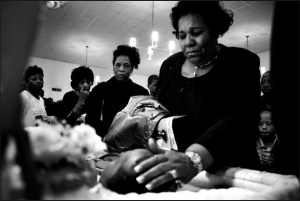 Chicago is the national leader in shootings and killings. Systemic oppression permeates the South and West side of the city, resulting in “long histories of poverty, joblessness, segregation and neglect” that serve as the roots for the large presence of gangs and firearms in the city (Gorner 2017). In Chicago, the violence is unceasing. Nationally, homicides and gang activity are on the rise. 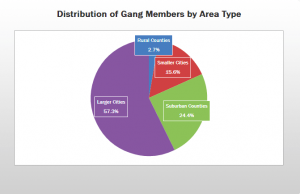 Predominantly concentrated in large metropolitan areas, gangs are responsible for 25% of the homicides in cities with populations over 100,000 (Axelrod, 2015). Axelrod (2015) reports that James Howell of the National Gang Center asserts that an increase in poverty and the corresponding decrease in social control is stimulating gang participation, especially among second generation immigrants. Overall Howell reports, there has been an 11% increase in gang participation over the last five years (Axelrod, 2015). Police departments across the country cite similar reasons for the increase in homicides: “gang violence and retaliation, violence associated with drugs, the overwhelming number of guns in many U.S. cities, and even problems related to conflicts originating on social media” (Sanburn and Johnson, 2017). In a study, it was found that “over three quarters of children in a high-violence urban area” came into contact with violence in their community (Community Violence, 2015). Non-white children in low-income urban areas where there are gangs are among the most vulnerable to being exposed to violence. This exposure has tangible effects on the children’s lives: many children develop PTSD which can affect their relationships, self-esteem, schooling, and more (Community Violence, 2015). In his study “Local Violence and Educational Attainment, Jeffrey Grogger (1997) concluded that violence within schools corresponded with decreased high school and college graduation rates due to the consequential decreased attendance and inability to concentrate within classes, among other factors. To overcome the limitation that more violent students (students in gangs or just students involved with violence) may be more prone to not graduating, Grogger studied nonviolent students. Surprisingly, he found that within this population as well, the presence of violence within school led to decreased graduation rates (Grogger, 1997). Studies have also found that violence can impair a child’s ability to learn. Patrick Sharkey (2010), a sociologist at New York University, found that black children performed worse on vocabulary and reading assessments when a homicide occurred in their neighborhood in the past week (as cited in Badger and Ingraham, 2016). This can have direct affects on a child’s education attainment and future life prospects, which Badger and Ingraham (2016) also report leads to children who live in high-violence neighborhoods having less economic mobility as adults. In short, the violence that is rampant throughout American society today is having very negative effects on the children exposed to it. Exposure is linked with detrimental psychological consequences, and is leading to lower educational achievement and attainment. Something must be done to address the violence, for it is severely harming millions of children nationwide and disproportionately affecting already marginalized communities.